Premier Podiatry director, Trevor Prior was recently asked to provide a foreword for a new book. 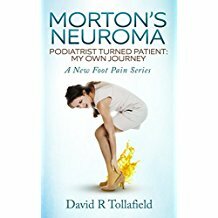 Written by Podiatric Surgeon David Tollafield, this books provides extensive information about the common condition, Morton’s neuroma. However, this is told with David’s unique position as both a clinician with many years of clinical experience and a patient with the condition. It was an honour to be asked to write the foreword and, at a modest price of £2.62, is well worth it for any patient suffering from this condition.